Fish is the Dish have a new campaign called Healthy and Happy Hearts, the challenge is to encourage families to eat fish twice a week. You can find out more about the challenge on the Fish is the Dish Website. They have tips, recipes and advice from not one but three Healthy Happy Heart Experts. I have taken up the challenge, you can too, there is a competition over on their page where they are giving 6 fish filled hampers away to help get you started. The campaign itself runs for 6 weeks and is designed to encourage us to eat more fish. I will be eating two portions a week of fish with my family for 6 weeks and see how we feel. The fish helps provide our bodies with the Omega-3 fatty acids which are good for us, especially our hearts. Not only that but it give us brain power, helps out muscles, bones and lets not forget the skin and hair properties it can help with. I love fish and so do the boys, but we really don’t eat enough of it so we are going to give this a good go. Our first dish was mussels, this is what I made. First off make sure your mussels are clean and beard free, these were, I only had to scrape a few bits off. Tap the shell of the mussels and if they close they are live. Any that don’t discard. Mussels should be cooked live. Chop the onions. Heat the olive oil in a pan and add in the onions, garlic and basil. Cook on a low heat for no more than 5 minutes until the onions are soft. Then add in the tomato puree, passata, sugar and salt and pepper to taste. Simmer this for about 30 minutes, until it condenses a fair bit. Put the mussels in another pot with a lid. Pour in the white wine and bring to the boil. 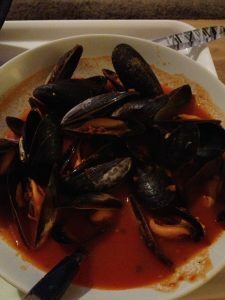 You only need to cook the mussels for a few minutes until they have opened, make sure you stir then a few times. Drain off the liquid in the pot and get rid of any mussels that haven’t opened. Pour the tomato sauce from the other pot once ready into the pot with the mussels and stir, heat for a minute or so and serve. I served this with some garlic bread. Except for hubby who had some gluten free bread. 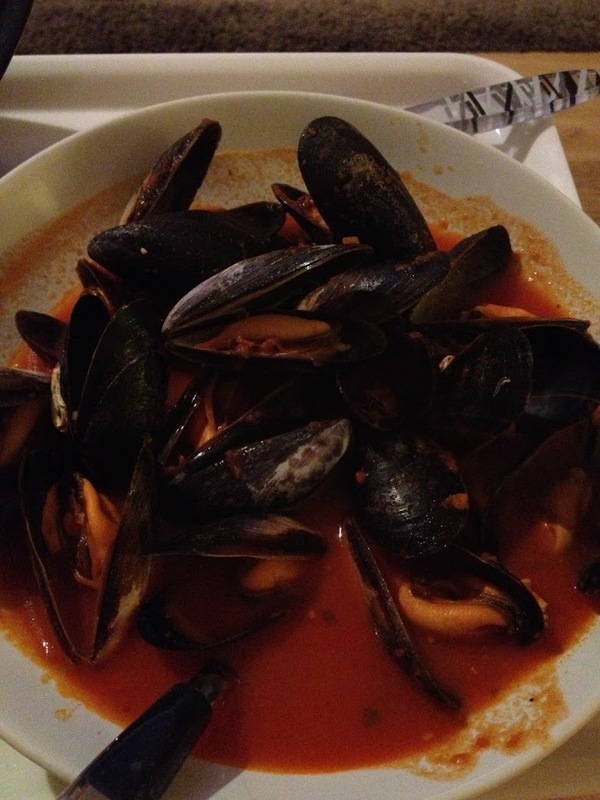 I love mussels, but hubby and the kids weren’t so keen. They did try them which was good. Lucas enjoyed them but the other two only ate a few, wimps. I have to say I’m a fan and will definitely make this again.